Celebrity Cruises’ ship Celebrity Solstice almost took out a small inflatable boat in Tauranga Harbour, New Zealand on December 14. The small craft ran out of fuel, and ended up almost directly in the path of the 122,000 gross ton ship. 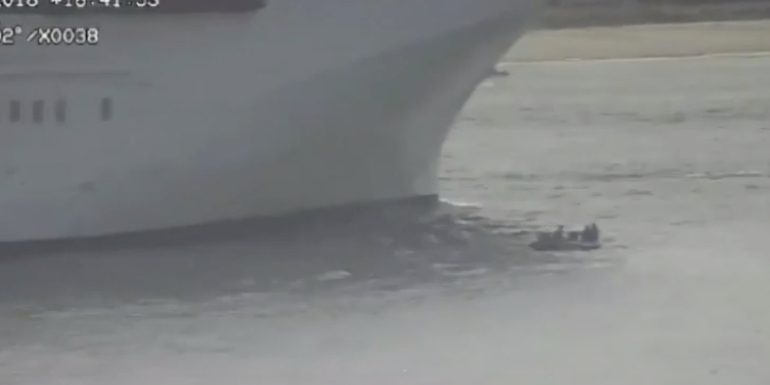 A video shared by the Bay of Plenty Regional Council shows the boat with four people on board floating in the channel as the vessel bears down on it. Luckily, Celebrity Solstice altered its course just in time and the bow of the ship passed within 16 feet of the boat as two other boats hurried over for rescue. One towed the boat out of the way as the bulk of the cruise ship passed. The following rules are in place for small boats, so that they don’t get into trouble near cruise ships like this one did: keep clear 50 meters to each side of a ship and 500 meters ahead. Thankfully, no one was injured in the near-accident. Do you think there should be stricter laws for boating around cruise ships? Tauranga Harbour is in New Zealand NOT Australia. Look on a map.